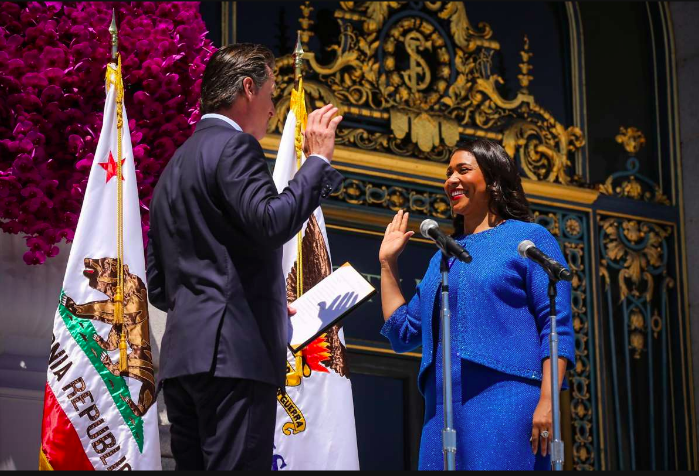 Mayor London Breed is sworn in as San Francisco’s 45th mayor by Lt. Gov. Gavin Newsom, this city’s 42nd mayor. Pool photo by Gabrielle Lurie, S.F. Chronicle. Attention brought about by London Breed’s involvement may harm her brother’s chances at clemency. And, now, unwanted details have been thrust before the public. “People tell me I have a great life story,” London Breed once told me. In a sense, they’re right; “great” is a complicated word. She grew up in San Francisco’s most dysfunctional projects and eluded rampant crime, poverty, institutional racism, and extreme family strife to earn multiple degrees, make her way in her expensive hometown, win elected office and, in July, get sworn in as this city’s first African American female mayor. The recent mayoral campaign in which Breed bested Mark Leno by a scant 2,500 votes was not one marked by deeply substantive campaigning or penetrating investigative media coverage. Prior to the race, campaign strategists told me it would be the most “story-driven election we’ve ever seen.” That was true. And Breed’s life story was, if not “great,” a great political asset. It’s real, and it appealed to this city’s voters in a way that transcended actual political achievements or tangible legislative accomplishments. But, there’s the rub: It is real. It continues to be real. To wit, last night, NBC Bay Area’s Jaxon Van Derbeken released a story revealing that our mayor has inveighed upon outgoing Gov. Jerry Brown to commute the sentence of Napoleon Brown, Breed’s older brother, who is midway through a 44-year term for manslaughter, robbery, and other crimes. Brown’s lengthy prison sentence stems from a concatenation of violent acts committed in the wee hours of June 19, 2000, in which he robbed the Johnny Rockets in the Marina at gunpoint and motored across the Golden Gate Bridge. His car came to a halt in the buffer lane, he pushed or kicked driver Lenties White onto the pavement, and he drove off. White was subsequently struck and killed by a drunk driver; before she died, she identified Brown as the man who ejected her from the vehicle. Court documents reveal that Breed, then 25, testified in court that Brown was asleep on her grandmother’s couch when she saw him at about midnight — he purportedly knocked over the Johnny Rockets between midnight and 12:30 — though she wasn’t sure if he was still there when she left. The jury convicted anyway — a salient detail considering Breed’s later choice of career. You could have always found these 18-year-old particulars tucked away in legal papers which are themselves tucked away on the Internet. But now they’re on television and in newspapers, on the front page. But is it unseemly? Is it a terrible look for the mayor? Is it a potential political nightmare? And with all of those negatives, could it actually harm Napoleon Brown’s chances of clemency from Gov. Brown? The answer to all of those questions is, arguably, yes. Mission Local has not yet received a statement from the mayor’s office regarding the alibi she provided her brother in 2000 — an act she did not disclose to Gov. Brown when asking for Napoleon Brown’s early release. (She also did not disclose that her brother was recently nabbed with heroin in prison.) Perhaps those really were her accurate recollections recited under oath. And, charitably, Napoleon Brown still could have left the Fillmore a bit before midnight and robbed the Johnny Rockets at around 12:30. But it’s not good to have to answer questions about 18-year-old testimony when you’re sitting in City Hall Room 200, which prompts the question of how this could have been better handled. That’s a hard question. In the end, the mayor’s life story isn’t a story for her. It’s her life. In life, you make tough decisions, and trying to help her family, despite political blowback, was the decision the mayor made. At the same time, local media, perhaps chastened that questions like those regarding the testimony are being asked months after the election and not before it, may reassess what other questions we should have asked before — and ask them now. This, too, is a potential byproduct of Breed’s actions. It’s uncertain this story, something of a modern-day Sophocles number, will end happily. Sophocles didn’t do “happy.” For the mayor to sow her own political misfortune with an act that actually decreases her brother’s chances at freedom would be a bitter and messy lose-lose. NextWho’s got the best Mission tamales? Sound off. I feel for the Mayor, who was caught in the unenviable position of having to choose between not supporting her brother and creating this present mess. And I think there’s some real questions when we talk about media coverage about what’s “fair game” during a campaign; I’m glad Breed was able to run on her own record and that the campaign wasn’t consumed with re-trying her brother’s case in the press. But it also feels pretty disingenuous that we spent a bunch of time during the “story-driven” campaign arguing about the number of bedrooms in Jane Kim’s childhood home when nobody asked Breed about the time she was her brother’s alibi in a homicide. I noticed one major item missing from your column, the name of the person that Napoleon Brown murdered, I guess that accidentally overlooked and they say that Trump shows no EMPATHY! Read closer. It’s in there. Just curious — can you tell us more about the sourcing of the actual letter she wrote? Based on what I see uploaded in your Scribd link, it appears to be in soft copy form (not even with a signature on it), which surprises me. I honestly am having a hard time understanding how that could have been obtained by the press. I will give the mayor a lot of slack here. It’s her brother. Good lord. I see no reason why Jerry Brown shouldn’t be hit up for a favor. He can say no. Breed has earned the right to ask. Should she have used personal letterhead instead? Yes. But isn’t Breed a different breed of mayor than usual? Yes. Real people with real life problems, and real life experience in leadership positions, versus entitled sterile rich folks—-isn’t that what we progressives have been begging for all these years? Like Stacy Abrams and her college debt? It’s a plus. Well here it is. A hi,an with a brother in the system. It’s real. Give her this one break. My two cents at least. Wait, didn’t Ed Lee assert that the alleged commission of a crime before taking office, in this case perjury in a murder case, was grounds for removal under Official Misconduct? And if Breed is a perjurer, how much of “her story” that she got elected on was a lie too? Ed Lee failed to persuade the BOS his interpretation of the charter was accurate. Secondly, Ross Mirkarimi had pled guilty to a crime at that point. I don’t see how it’s relevant. Breed’s house was a literal 5 minute drive from the old Johnny Rocket’s. The original police report put the crime at 12:40. The chances of this moving past anything but innuendo are slim to none. I encourage anyone who is interested in this situation with the Mayor to read the last legal actions in the case, a writ of habeas corpus filed by Brown, and his appeal when that was denied. In these documents, you can read the details of the case as presented in court. This is a problem for the Democratic Party. It seems Ms. Breed provided misleading testimony in a felony crime. We have a President who has little regard for the law. If the Dems (and I’ve been a lifelong one) excuse Ms. Breed, how can they hold the President and his family to account? City title or designation in any communication for any private gain or advantage. The following activities are expressly prohibited by this section. No employee or officer may use City letterhead, City title, City e-mail, or any other City resource, for any communication that may lead the recipient of the communication to think that the employee or officer is acting in an official capacity when the employee or officer is not. No employee or officer may hold himself or herself out as a representative of the Department, or as an agent acting on behalf of the Department, unless authorized to do so. You have to treat this as if it came from Trump, based on that she was trying to Obstruct Justice , and She Needs To Resign ! Here’s the 2 bad bad & dirty NEW things Mayor London Breed has just done that will hurt us all: 1) not included the FACT & HONEST TRUTH that her dear & loved big brother & repeat offender, CA Prison Inmate Napolean Brown, had recent 2017 HEROIN while in lockup with 2 years new sentence for his NEW CRIME added to his already plea-reduced 42 year sentence for the horrible 2000 armed, takeover-style robbery of cute Marina District Johnny Rockets restaurant, with subsequent evasion by getaway car & then the horrific death of his supposed friend & mother of 2, Ms. Lenties White, who was thrown out of the car while ON the Golden Gate Bridge, then run over by another driver; 2) not thought about how her loved brother is clearly NOT well or healthy or balanced or “REHABILITATED” or even ready for release back into the world or wild SF ! Hello. And…please don’t let him sleep on her couch anymore or be supervised by her if & when he is eventually released.